Welcome to Charter Fire Protection Inc.
Visit our Contact Page for more direct contact information. Full service for automatic fire sprinkler systems. Quarterly and Annual fire sprinkler system inspections and certifications. Fire pump testing and certification for both diesel and electric. 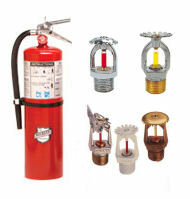 Fire Extinguisher sales and annual inspections. Certified fire	line	backflow	device inspections. Certified to test domestic backflow devices for homes and businesses.